Cynophobia, or fear of dogs, is an extremely common specific phobia. Although snake and spider phobias are even more prevalent, the average person is far more likely to encounter dogs in his daily life. A phobia of dogs can be devastating, limiting your contact with dog-owning friends and relatives and curtailing your normal activities. Like most animal phobias, fear of dogs is most commonly caused by a negative experience with a dog, especially during childhood. Both children and dogs are naturally curious, and you may have been jumped on by an overexcited puppy or growled at by a large watchdog as you approached a fence. A large dog can make a major impression on a small child, even if no actual attack occurred. The negative experience need not have affected you directly. Many parents warn children about approaching strange dogs. A child's fertile imagination combined with an incomplete or even erroneous understanding of dog behavior could lead to a full-blown phobia of dogs. If a friend or relative was attacked by a dog, or a parent harbored an unhealthy fear, the risk of developing Cynophobia is increased. Like all phobias, the fear of dogs can vary dramatically in severity from person to person. You might fear only large breeds. You may be uncomfortable around live dogs but be perfectly content to view dogs in photographs or TV shows. Likewise, the symptoms of Cynophobia can also vary. Common reactions include running away, freezing in terror, and attempting to hide. You might shake, feel nauseated or disoriented, or even begin to cry. Anticipatory anxiety frequently occurs in the days leading up to a known confrontation. Because dogs are so popular as pets and companions, avoiding them can be nearly impossible. You might find yourself limiting contact with dog owners, even to the point of avoiding family gatherings. 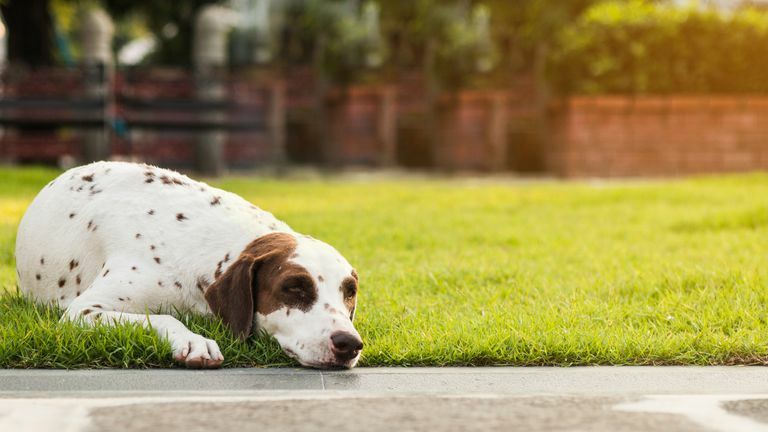 You may be unable to enjoy outdoor activities such as walking in the park, hiking, or camping since many outdoor enthusiasts bring their dogs. Over time, your normal routine may become extremely restricted as you attempt to prevent any accidental contact with a dog. This increasing isolation can lead to depression and other anxiety disorders. Some people develop a social phobia and even agoraphobia as they become more and more unwilling to leave their homes. Like all animal phobias, the fear of dogs responds quite well to treatment. Cognitive-behavioral techniques such as systematic desensitization and flooding are designed to help remove the fear and encourage more helpful coping skills. Although these techniques are traditionally performed using live dogs active-imaginal exposure may be done. If you are given this type of treatment, you will be encouraged to act out positive behaviors such as approaching and petting a dog. Instead of interacting with a live dog, however, you will vividly imagine the dog. If your phobia is severe, medications might be used in conjunction with therapy. Certain medications can significantly reduce your anxiety, allowing you to focus on the therapeutic techniques. Although Cynophobia can be devastating, it is extremely treatable. With a bit of work, there is no reason that you must continue to suffer. Is Phasmophobia a Sign of Disordered Thinking? Did You Know That a Phobia of Chewing Gum Actually Exists? Are You Afraid of Outer Space?